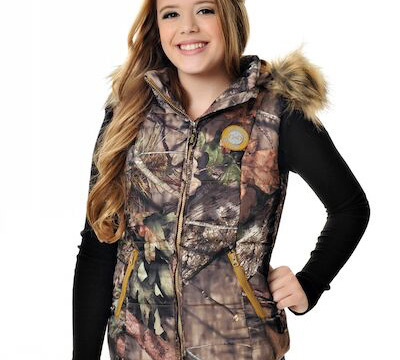 Just like the GWG® Fur Hoodie, the Fur Vest from Girls with Guns® Clothing was designed for warmth and style. This vest is a slim and trim version of everyone's favorite puffy vest, featuring low profile quilting with a light, synthetic fill and a gathered back for shape. The removable zippered hood and removable snap fur trim make this vest easy to wash and wear. 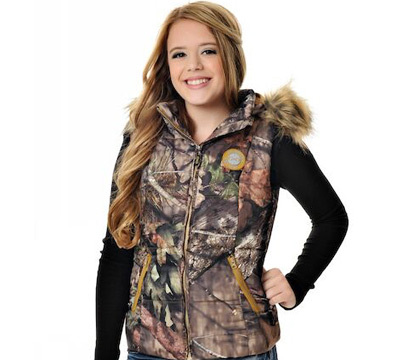 Feaures include: Mossy Oak Break Up Country, Detachable Hood and Fur, Jr. Fit - Suggest Going up a Size, 100% Polyester, and Imported. Made by Realm Brands, LLC. LIMITED TO STOCK ON HAND. NO BACKORDERS.